Society of Professional Journalists Says "No Mas" to Term "Illegal Alien"
In an interview with Rodney Ho of the Atlanta Journal Constitution, CNN’s Erin Burnett spoke about her new show and said that she isn’t going to be studying the ratings. 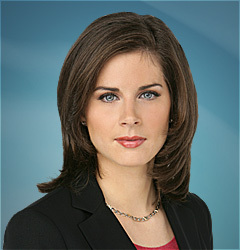 Burnett, who was considered a rising star at CNBC, is breaking from her business background to pursue her interests in the Middle East and China, as well as in women’s issues. She will anchor her new show in primetime though the exact details were still being worked out when Ho interviewed her. She also made it clear that she felt that the 7 p.m. hour is a news hour and not for political punditry, which, if she sticks to reporting the news, will differentiate her show from her competition on MSNBC, normally a rerun of Chris Matthews’ 5 p.m. live opinion show. The show debuts on Monday, October 3, and even though Burnett may not be studying her ratings you can be sure her bosses will be. CNN has been on a tear recently in the ratings and is threatening to overtake MSNBC as the number two cable news network. Burnett’s program is, at least for now, the last piece of the puzzle of their strategy to accomplish that.